Once again, it’s cookie time! I would be in the wrong business if i weren’t constantly testing gluten free cookie recipes right?! 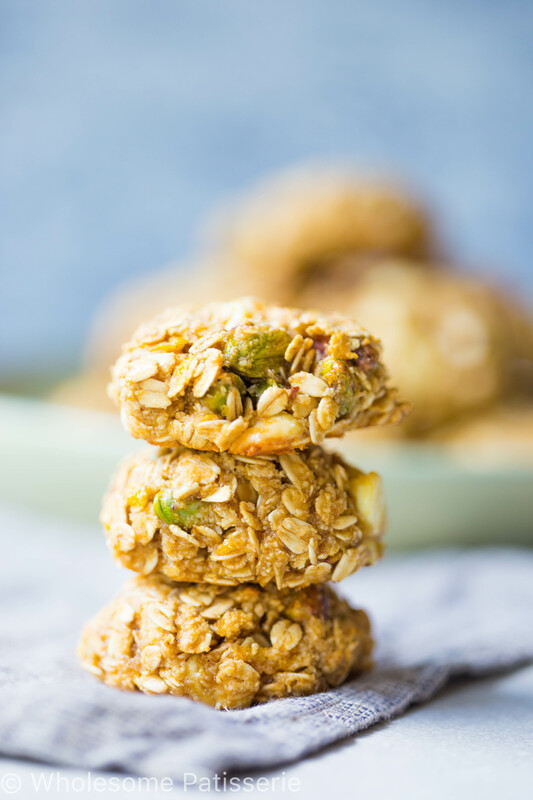 These gorgeous creations are my Pistachio White Chocolate Chunk Oat Cookies. Ok let me explain this. 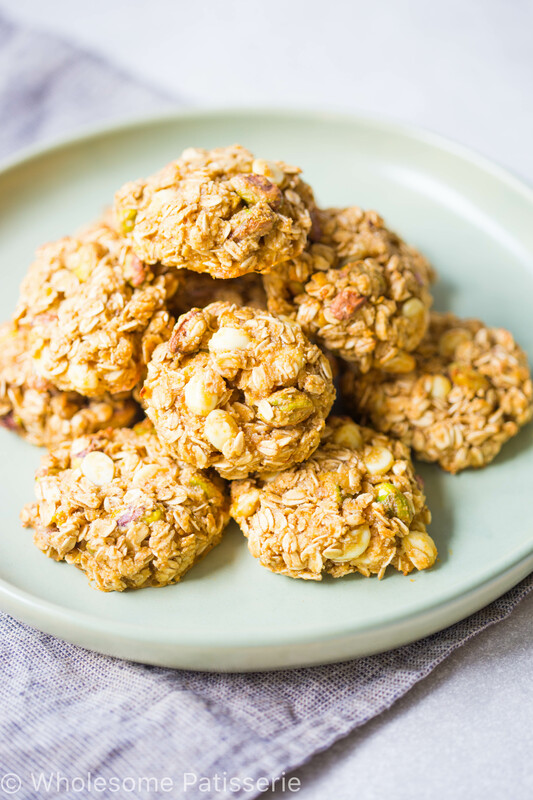 Think oat based cookies, moulded together by caramelised raw honey with chunks of whole pistachios, white chocolate chips and bursts of lemon zest throughout, pretty impressive right? 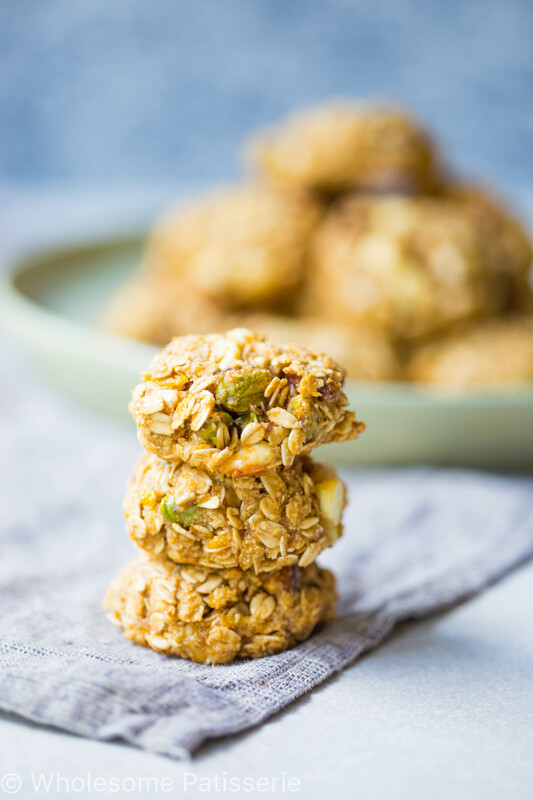 I adapted this recipe from my Chocolate Oat Cookies because i love to use trustworthy gluten free cookie recipes because why fix it if it ain’t broke? Well what i mean is that you can alter a previous recipe using the same base elements but switch it up with different flavours and ingredients to create a brand new yummy recipe. I just realised that this recipe doesn’t contain dark chocolate! Record this moment guys, this is rare for me. I did however still use white chocolate, you can’t tear me away from all the chocolate now! Caramelised raw honey oat based gluten free cookies with scattered whole pistachios, white chocolate chips with bursts of lemon zest! Pretty impressive right? 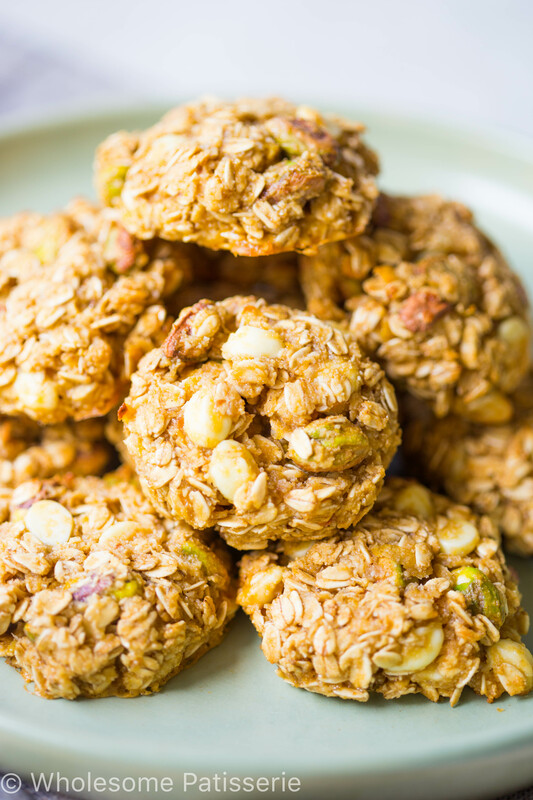 In a large mixing bowl, combine oats, almond meal, sugar, baking powder, zest, pistachios and chocolate chips. In a separate mixing bowl, whisk together eggs, juice, honey and vanilla. Place them on your prepared baking tray, 1 inch apart, pressing down on them slightly. Bake cookies for 12-15 minutes or until golden brown and they lift off the baking sheet. Let cookies cool on tray for 10 minutes before removing.